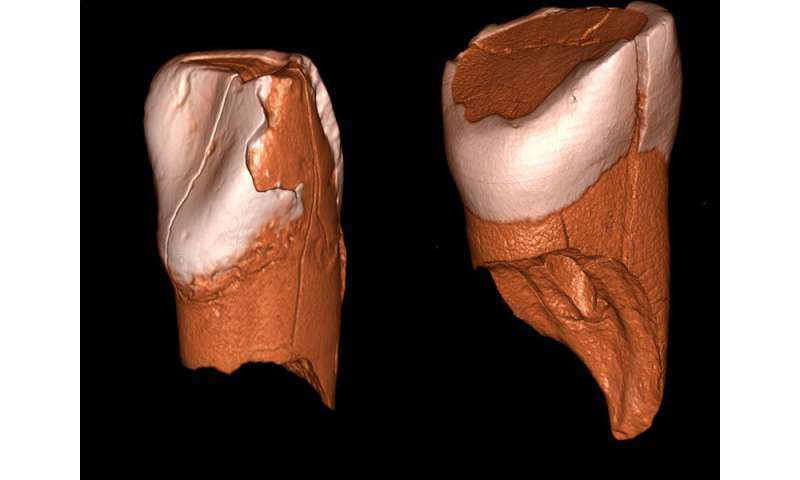 Researchers from the University of Bologna, Italy, and the Max Planck Institute for Evolutionary Anthropology in Leipzig, Germany, analysed two deciduous teeth from the prehistoric sites of Grotta di Fumane and Riparo Bombrini in Northern Italy. The state-of-the-art methods adopted in this study attribute the teeth to anatomically modern humans. New AMS radiocarbon dates on bones and charcoal from the site of Riparo Bombrini, along with previously published dates for the Grotta di Fumane sequence, show that these teeth represent the oldest modern human remains in an Aurignacian-related archeological context, overlapping in time with the last Neandertals. The results have strong implications for our understanding of the interaction between modern humans and Neandertals, as well as for the debate on the extinction of the latter. The Protoaurignacian culture, which spread in Southwest and South-Central Europe around 42,000 cal BP, was characterized by a remarkable set of technological innovations in stone knapping and bone tool industries, as well as by the large use of personal ornaments. Since the Protoaurignacian overlapped in time with the last Neandertals, it is pivotal to identify the makers of this culture to shed light on the demise of Neandertals. Unfortunately, only two sites have provided unambiguous human remains associated with the Protoaurignacian: Riparo Bombrini (Western Ligurian Alps, Italy), where a deciduous incisor was found in 1976, and Grotta di Fumane (Western Lessini Mountains, Italy) where an upper deciduous incisor was found in 1992 by the team from the University of Ferrara. Stefano Benazzi from the University of Bologna and colleagues from the CNR Institute of Clinical Physiology (Pisa, Italy) compared digital models from CT scans of the human tooth from Riparo Bombrini with those of modern human and Neandertal dental samples. Digital methods were used to compare the internal features of the dental crown, namely the thickness of the enamel. The results showed that the specimen from Riparo Bombrini belonged to a modern human. Viviane Slon and colleagues from the Max Planck Institute for Evolutionary Anthropology were able to analyse the mitochondrial DNA from the Fumane 2 dental specimen, discovering that its mitochondrial genome falls within the variation of modern humans and basally in haplogroup R, which is typical for pre-agricultural mtDNAs in Europe. Sahra Talamo from the Max Planck Institute for Evolutionary Anthropology undertook a comprehensive programme of radiocarbon dating to establish a firm chronology for the tooth from Riparo Bombrini, ascertaining that it is about 40,000 years old. "Human fossil material is very rare, particularly well preserved deciduous teeth. It is only thanks to the collaboration of several European institutions that the fossil remains could be investigated fully", says Benazzi. "The classification of these two human remains was only made possible through technical innovations developed in the last decade, i.e. high-resolution computed tomography/digital methods and ancient DNA. These new techniques and radiocarbon dating will help to address taxonomic questions associated with other contentious human fossils". "At the time of the replacement of Neandertals by modern humans in Europe, the biological nature of several contemporaneous European populations remains unknown, and so far there has been no direct evidence that the earliest Aurignacian, a culture of many technical innovations, was actually produced by modern humans", says Jean-Jacques Hublin, director of the Department of Human Evolution at the Max Planck Institute for Evolutionary Anthropology and co-author of the study. "The association of modern remains with the earliest Aurignacian-related archaeological context now provides physical evidence that the arrival of our species on the continent triggered the demise of Neandertals, who disappeared a couple of millennia later." They are alive and well, they are called Russians.